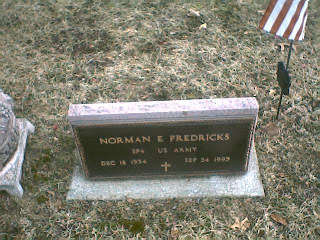 Norman Eugene Fredricks was born 18 December 1934 in Manistee County, Michigan and died 24 September 1995 in Manistee County, Michigan. He is buried in Brethren Cemetery, Brethren, Manistee, Michigan. He never married.